About a month ago, our neighbors invited Matt and me over for a nice dinner, and boy were we impressed! On the menu was osso bucco (don’t even ask me how to pronounce it), Ina Garten’s Easy Parmesan Risotto, a caesar salad, and an amazing 3-ingredient icebox chocolate cheesecake from Food & Wine! 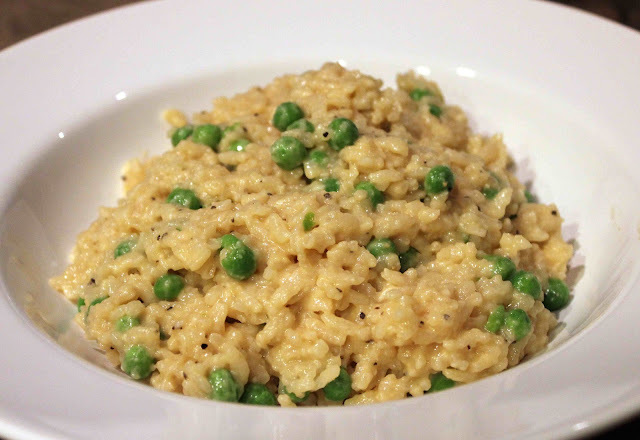 Everything was delicious, but I was most impressed by the risotto since it is super simple to make, and yields a 5-star presentation at any dinner table. Combine Arborio rice and chicken stock in dutch oven and cook for 45 minutes in a 350 degree F oven. 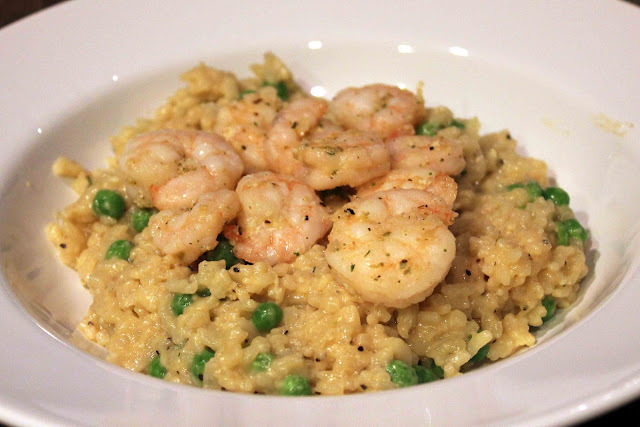 Like I said, risotto is super easy to make. 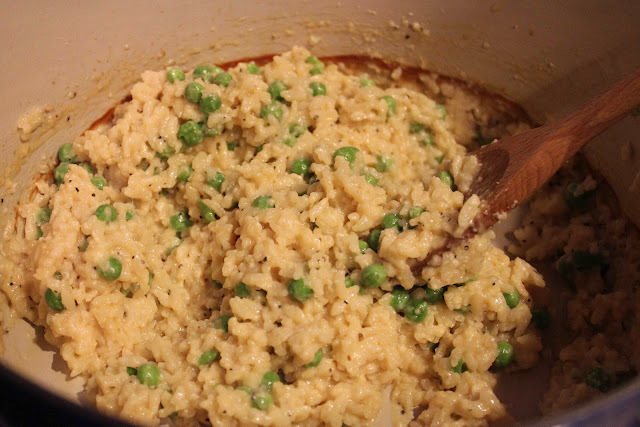 Simply pour your chicken stock and Arborio rice into a Dutch oven and then let it cook in the oven for 45 minutes. During that time, I got a full in-home weights workout while catching up on my favorite soap opera, The Bold and The Beautiful. Add remaining chicken stock, Parmesan, wine, butter, salt and pepper and stir vigorously for 2-3 minutes. After 45 minutes, simply add the rest of the chicken stock, Parmesan, frozen peas, wine, salt, pepper and butter. That’s it… all done! However, since I didn’t want to eat just rice for dinner, I grilled up some shrimp seasoned with salt, pepper and a little Parmesan for my source of protein. Excellent meal. Quick. Easy. It would impress just about any guest at a dinner party. Enjoy! 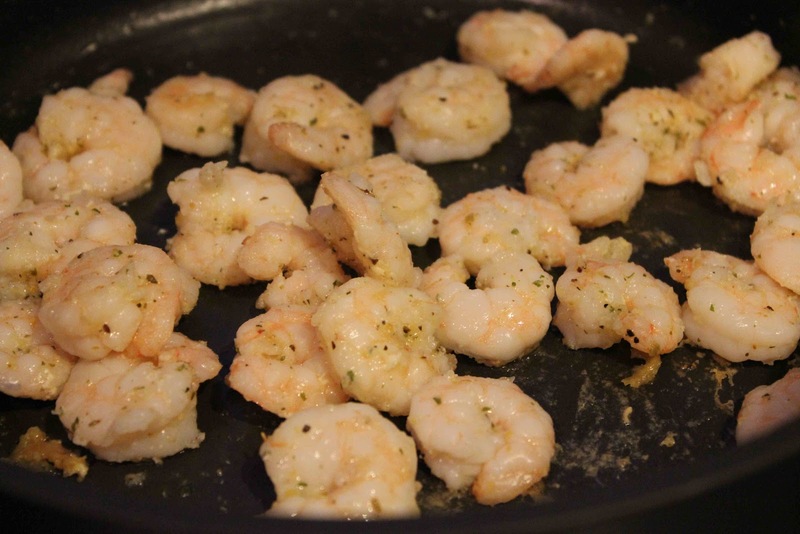 In a grill pan, heat shrimp over medium-high heat. 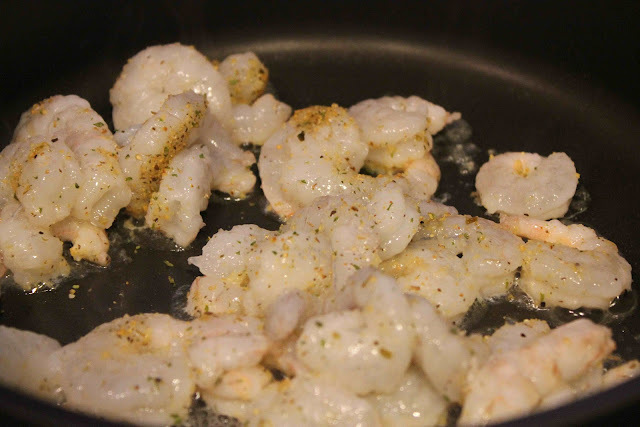 Cook shrimp until opaque and slightly firm. 2. Place the rice and 4 cups of the chicken stock in a Dutch oven, such as Le Creuset. 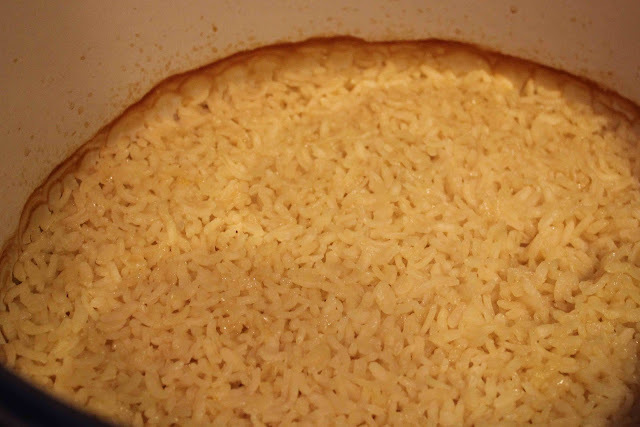 Cover and bake for 45 minutes, until most of the liquid is absorbed and the rice is al dente. 3. 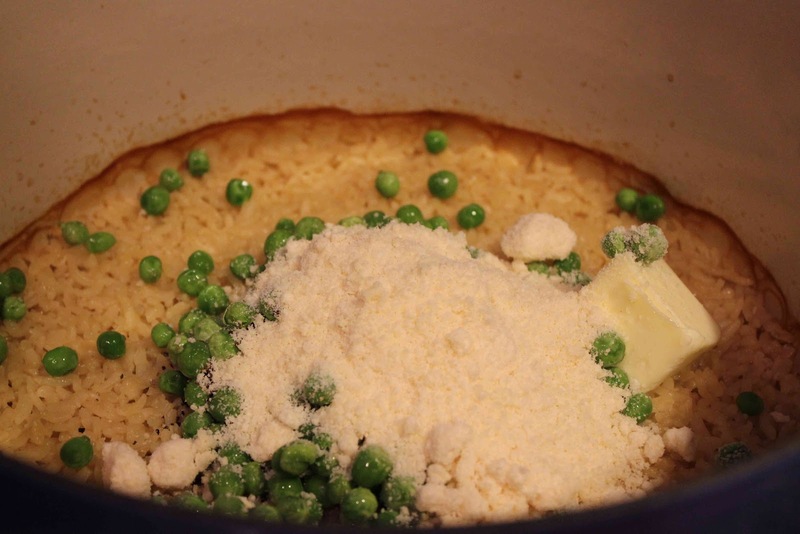 Remove from the oven, add the remaining cup of chicken stock, the Parmesan, wine, butter, salt and pepper, and stir vigorously for 2 to 3 minutes, until the rice is thick and creamy. Add the peas and stir until heated through. Serve hot.